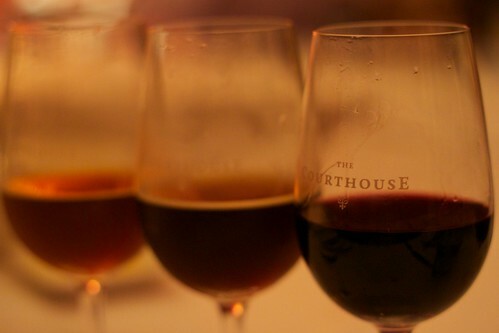 It seems only fitting that at a pub called The Courthouse one should deliberate upon the merits of both good beer and good wine and so one evening a large contingent of the Australian Beer Writers’ Guild found themselves at The Courthouse in North Melbourne to do just that at the invitation of Scott, the manager and the newly appointed (at the time) head chef Julian Hill. I have nothing but deep admiration for wine nerds: there is so much to learn and as much as I would love dearly to be as wine nerdy as I attempt to be beer nerdy (for I also have bucketloads to learn in that area too), the truth is, I’ve no idea where to start. Yes, it is that simple. It also feels more intimidating. It might sound stupid, but this is not a thought process exclusive to foodie-drinkie aspects of my life. I’ve been a classical flute player for half of my life and absolutely terrified of learning jazz because I never felt I mastered classical. However, as if to ease us in, we were given a canapé that had only a beer match: an ocean trout cornet matched with the Cantillon Rosé de Gambrinus. It looked beautiful and tasted delightful and got the table talking excitedly in promise of what was to come. 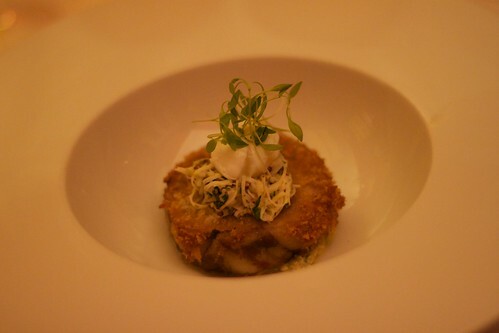 The first proper course, the entrée, was crumbed pork head with sauce gribiche and remoulade. It seems any meat on the pig’s head is prized for its porkier-than-usual element and the course was matched with a whopping three beverages: two beers – the Stone and Wood Pacific Ale (formerly known as their Draught Ale) and the Weihenstephaner Kristall Weissbier, a beer from the oldest brewery in the world. The wine chosen was the Max Ferd Richter Brauneberger Juffer riesling from 2008. To my palate, the best match was the Kristall Weissbier though even that was not entirely perfect: I felt the course needed something along these lines style-wise but more ‘beefed up’. The Stone and Wood beer oddly enough got too hoppy: not usually an issue I would raise with this particular beer as I find it quite fruity and enjoy its passionfruit notes. 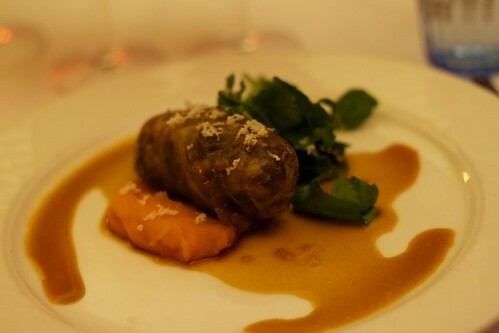 For the next course of venison shanks en crepinette with sweet potato and horseradish, it was the same deal – two beers and one wine and left up to us to nominate the one that best matched the course. The meal had a distinctly French slant to it and this largely reflects what The Courthouse do, both in their dining room menus and the pub fare available in the less formal area. From left to right we have the Bridge Road Bière de Garde, Three Ravens Dark Alt Noir (a Melbourne microbrewery out in Thornbury!) and the Alpha Box and Dice ‘Enigma’ Barbera-Cabernet Sauvignon blend from 2009. The liquid match here was no contest: it was the Bière de Garde (god, am I forever jealous I missed out on imbibing this confessed favourite on hand pump at the Tanswell pub in Beechworth. The Three Ravens I had sampled prior to dining and the Barbera-Cabernet Sauvignon I found too rough on my palate. Yes, I emphasise ‘my’ palate and fully disclose that it is not one developed for adequately judging wines. 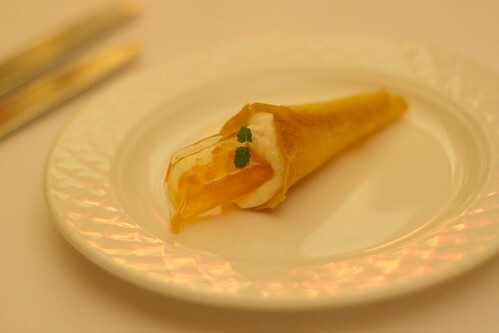 Usually, French-influenced dining gives you the choice of a cheese or dessert course. 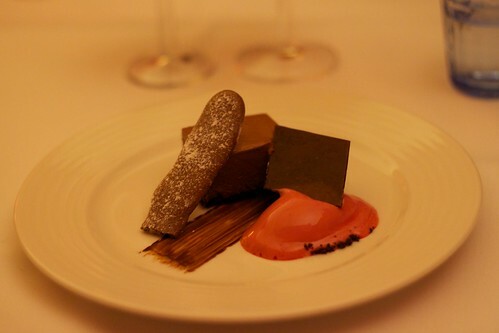 Scott and Julian exceeded our expectations by spoiling us with both: to finish, we were treated to ‘textures of chocolate’ and raspberry sorbet. It sounds like a standard dessert but the treatment of chocolate in its various iterations ensured it stayed interesting. The two beverages served with this were the Hargreaves Hill Abbey Dubbel and the NV Sanchez Romate Cardinal Cisneros Pedro Ximenez, the latter of which won most of the hearts around the table as best suiting dessert. But Hargreaves Hill was yet to come back to a triumph for the last course of Isle of Mull cheddar, beating the De Bortoli Melba Reserve cabernet sauvignon 1999 vintage with their humble English Special Bitter. I confess I am very partial to a good ESB though I seem to recall that this was one of the pairings that divided the table the most. 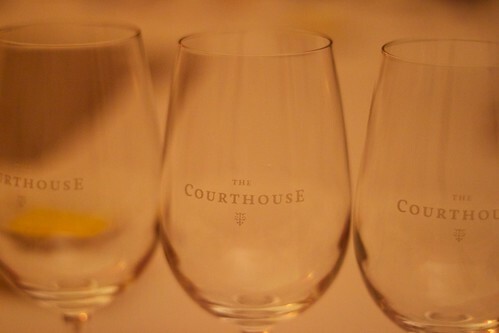 The excellent news is that you do not have to be an Australian Beer Writers’ Guild member to come along to such a dinner as the folks at The Courthouse have decided to host one for the general public! Simply head on to The Crafty Pint for booking details – several ABWG members will be there and we’d love to say hello and hear your thoughts on whose alcoholic beverage reigns supreme! Crafty on the right, Champion of Beer. 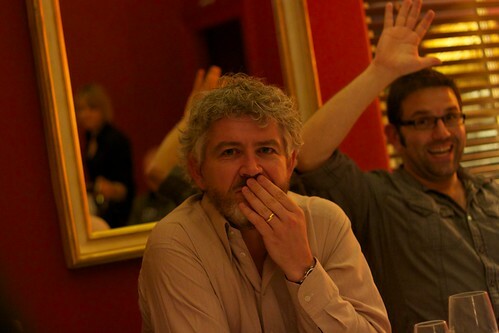 Chris McNamara on the left, Reformed Wine Nerd ponders his defection to the dark, beery side. Could it be that he is thankful for his defection when beer was named the winner on this very night…? *we encourage responsible drinking. Please don’t brawl. Bruises and the like will hurt when you’ve sobered up. This entry was posted in craft beer goodness, eatie-foodies dining out and tagged Alpha Box and Dice Enigma Barbera-Cabernet Sauvignon 2009, Australian Beer Writers' Guild, beer and food matching, beer versus wine, Bridge Road Brewery Biere de Garde, De Bortoli Melba Reserve cabernet sauvignon 1999, French cuisine, gastropub, Hargreaves Hill Abbey Dubbel, Hargreaves Hill ESB, Max Ferd Richter Brauneberger Juffer riesling 2008, modern Australian cuisine, North Melbourne, Sanchez Romate Cardinal Cisneros Pedro Ximenez NV, Stone and Wood Pacific Ale, The Courthouse, Three Ravens Dark Alt Noir, Weihenstephaner Kristall Weissbier, wine matched dinner on August 22, 2011 by gem. Heading back off into the doom and gloom after a pitstop at Eclectic Tastes in Ballarat, Tris drove while I wrestled with the car heater and cranked out guilty pleasure DJ sets for hours. 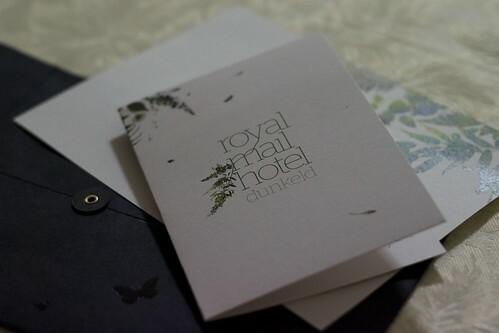 Eventually, we arrived at our destination: the Royal Mail Hotel in Dunkeld. Our combined glee was palpable and understandably so. Internationally recognised food celebs like Anthony Bourdain rate it quite highly (though I can’t find his alleged quote that it’s in his personal top five restaurants in the world) and it’s really, well, bluntly, in the middle of nowhere. So, why does it lure so many intrepid foodies? Well, I hope to show you by reporting on our visit and would be keen to hear whether it would lure you, dear reader. However, it isn’t just the dining that’s highly seductive: actually staying at the apartments is a wonderfully lavish experience and highly recommended. As part of the package booked, we got complimentary sparkling wine, chocolates and fresh fruit upon our arrival (and Aesop toiletries also got me awfully excited, I confess!). I got into my evening wear and when I emerged, we tucked into these goodies in front of an open fire that Tristan had stoked in quite the becoming manner. So yes, staying at the restaurant’s accommodation is a definite no-brainer. 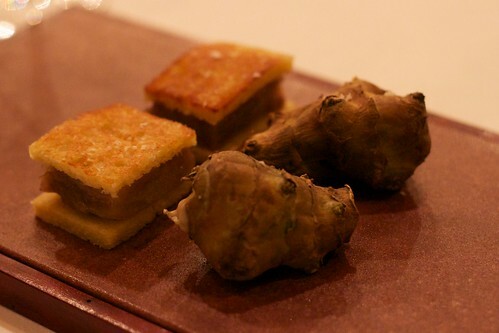 On the particular evening we dined (mid-May, with their omnivore autumn menu, changing with the seasons), our meal started with a playful interpretation of a pork sandwich and a Jerusalem artichoke. Easily the poshest pork sanga I’ve ever eaten and the artichokes were deceptive if you chose to judge them upon looks: its hide was quite tough, but velvet-soft purée was to be found once bitten into. Both provided a textural jaunt in the mouth. The liquid accompaniment was a glass of Ca’del Bosco Prestige Brut NV from Italy: I fully disclose that my wine knowledge is non-existent and cannot offer any tasting notes above the calibre of “cor, that’s nice!” or “hmm…this one’s not really my thing”. You’ve been amply warned (sorry!). More textural and aesthetic play was at hand with the first official course – the duck ham (which provided many a ‘cor blimey’ moment! 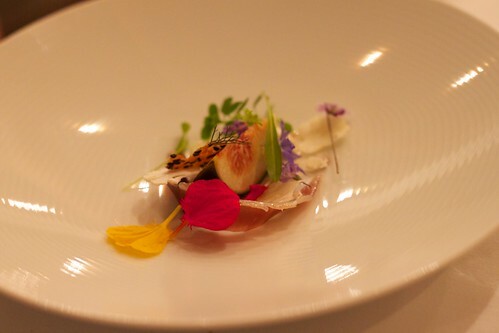 ), fig, kohlrabi and autumn blossoms. They’re so gorgeous on the plate that it seems a shame to desecrate them with one’s eating implements, would you not agree? A glass of Lustau dry oloroso ‘Don Nuño’ NV from Spain was perhaps not enjoyed as…politely as it deserved (read: I slugged it down because it was divine). The tomato on toast with handmade sheep milk ricotta looked far less precious and you would be forgiven for thinking it a trifle…unremarkable? Toast, a chunk of tomato and cheese: the words make it sound unforgettable but it blew all expectations – my eyes widened with the first mouthful. 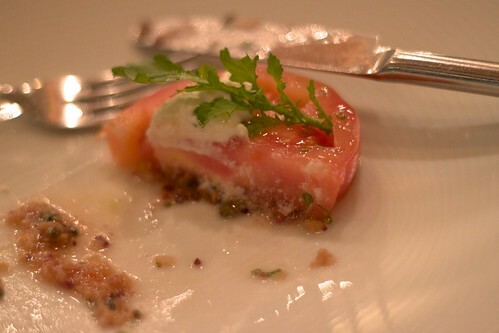 Tristan, a former raw tomato-hater echoed my gustatory giddiness. To accompany, a glass of the Crawford River cabernet rose, 2010 from this here state Victoria. 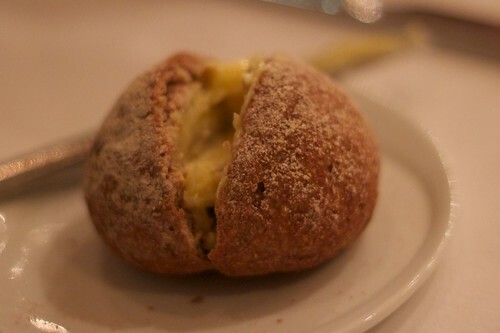 The little knowledge of the menu I was armed with came largely from Claire’s fab review of the restaurant and the one dish I was really wanting to see was egg yolk, rye, yeast one. When she dined there, her version had asparagus whereas our menu specified that we’d have legumes – no specific one was listed. 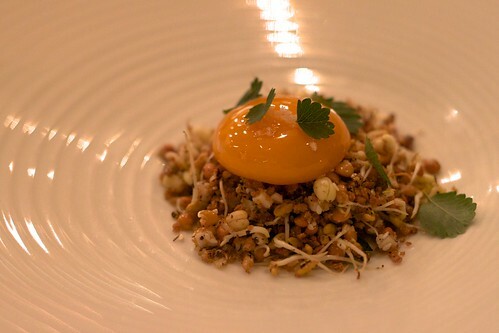 It looks so pristine, the way the egg yolk sits atop the toasted rye; again, that conundrum – you don’t want to ‘spoil’ the edible sculpture but when you do, your tongue is amply rewarded. The crunch and toastiness against the egg is blissful. We were served this with a 2007 Dalwhinnie chardonnay from Victoria. The dishes at this stage become less entrée-like and thus more meat and seafood laden. 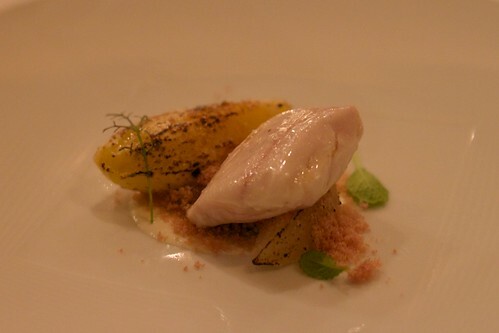 The first of such courses was the sand flathead with burnt potato, mustard and nashi. Though it surprises me, I enjoyed the ‘accompaniments’ more than the actual fish. There is something about the simplicity of potato done well that I just cannot resist – think, for example, on Attica’s eponymous potato dish. The wine matched was the E. Guigal ‘La Doriane’, 2001 from France. 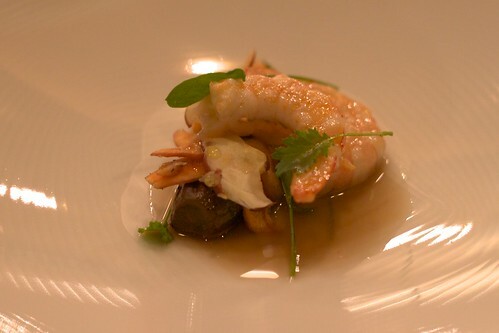 Next up, a lighter offering – prawn and eggplant with wild mushrooms and cured kelp. 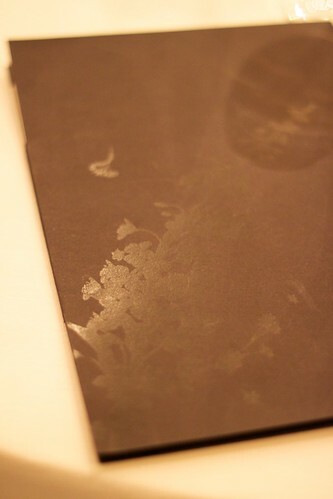 The delicate broth paired wonderfully with the scant greens offered, it was elegant and lovely. Heading more into my personal preference in regards to wine territory (reds over whites), a glass of the 1990 Wynns ‘John Riddoch’ cabernet sauvignon accompanied. 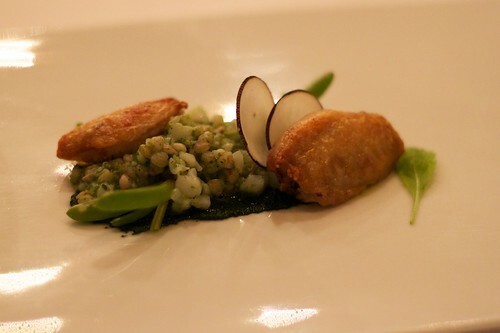 The chicken, scampi, buckwheat, miso and sea lettuce offering was wonderful – I’m favourably biased towards buckwheat and miso and enjoyed the scampi more than the chicken. Some really delicate flavours here and again, thoughtful aesthetic touches. A glass of the Laurent-Gevery-Charbertin ‘Tradition’, 1998, from France accompanied. One more savoury course! 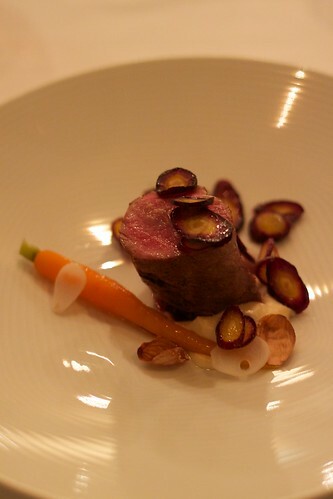 This one I gobbled up ‘heartily’ – lamb and carrots, soy cream and garlic flowers, the latter two elements making your standard ‘meat and veg’ extraordinary. Back to Australia wine-wise with a 2005 Highbank cabernet blend. I am ashamed to admit that by the time dessert courses came out, my stomach stood well and truly defeated and most of my serving went to the (bigger) better half. 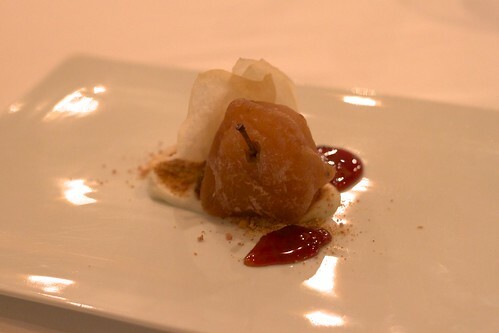 The first desserty course was fallen fruit – apple, almond, caramel and chamomile. The apple had a candied quality to it. 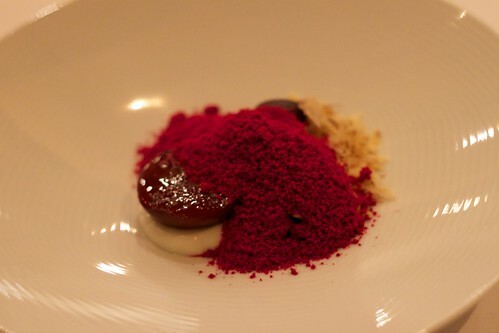 Reminiscent of Attica’s ‘terroir‘ dish, the next one was plum, fig and walnut, beetroot and cocoa ice. I love the vibrancy of beetroot powder and how seductively it is draped over the fruit. 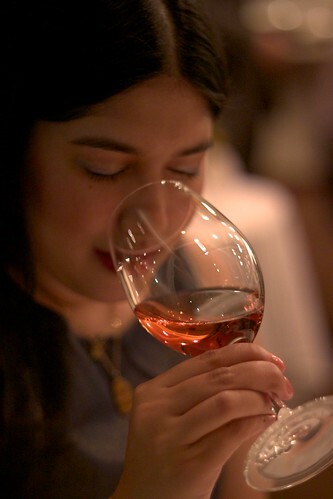 An Italian wine was served – the 2008 Marenco ‘Pineto’ Brachetto d’Acqui from Piedmont. Last sweet edible sculpture up! 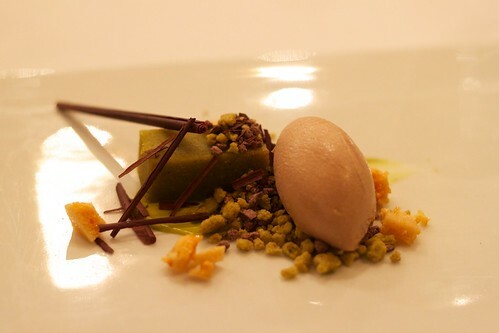 To finish completely, combination of pistachio, hazelnut, honeycomb and chocolate – quite simple ingredients by themselves but rendered like so, a treat. This was finished with a Sanchez Romate cream sherry, NV, Spain. It would appear I rather have a taste for sherry: my rule of thumb is if I recall more than just the taste, like, for instance, its mouthfeel (which I remember being divine), then it must be something I really enjoyed, again not being wine nerdy. One can expect that such a sublime, romantic experience will not come cheap (both Tris and I were celebrating our birthdays albeit fairly late) and you can expect a dine-and-stay package for two to come to the thousand dollar mark, but what price happiness (and saving for ages)? Easily one of the most memorable weekends of my life, where everything seemed perfect in that dare I say it, film-like way. I find it hard not to look back on that weekend through rose-tinted glasses, I admit it. Should you be lured to make the trek, you may find yourself in the same position: here’s hoping. 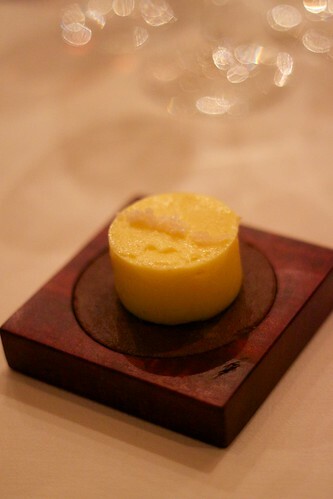 This entry was posted in eatie-foodies dining out, food blog wanksters travel, what has gone before and tagged degustation, Dunkeld, Grampians, modern Australian cuisine, Royal Mail Hotel, wine matched dinner on June 16, 2011 by gem.